Welcome to the Grey-Bruce section webpage. The poster for the 2018 Grey-Bruce section flagship event is up now. Check it out below.... www.cvmg.ca/rally will take you to our Hepworth rally website. The Grey-Bruce rally now is under new leadership. Kevin and Julie Moores are now rally chair. On the 6th of October of 2016 a cheque for $500 was donated to the Kiwanis of Owen Sound by the Grey-Bruce rally committee. Picture pages are below. Click on any of them and a picture album opens. "About Us" information - just click on this link, to download a copy of our section background. Note it is a 2.9 MB file, and so may take a while on some connections. This site has been posted here for information concerning the Grey-Bruce Section of the CVMG. Riding is what we do on the Grey-Bruce peninsula. Stellar roads with minimum traffic is what you come to expect here. If you'd like to come visit and chat, you're more than welcome. If you like to ride, we're always ready to go. We hardly need any prodding to ride our vintage motorcycles. If you have any pictures that need adding to our slide show here, get them to the Grey-Bruce webmaster and they will be added without delay. The Grey-Bruce area has limitless possibilities for motorcycle tours to satisfy many interests: waterfalls, coastal roads on the Lake Huron side -- Ontario's west coast -- or the Georgian Bay side, viewpoints along the Niagara Escarpment, quiet towns and villages with restaurants catering to every taste. How about one of the world's longest fresh-water beaches? Sauble Beach is known far and wide, and it's right here. Haven't caught your fancy yet? How about a tour of the many lighthouses that dot the peninsula's rocky coastline? These sentinels of the night each tell their own story, and various historical plaques along coastal roads indicate that maritime tragedies occurred in spite of the best efforts of the lighthouse keepers. Finally, remember that free Grey-Bruce maps are readily available from any tourist information kiosk or museum outlining all of the above. 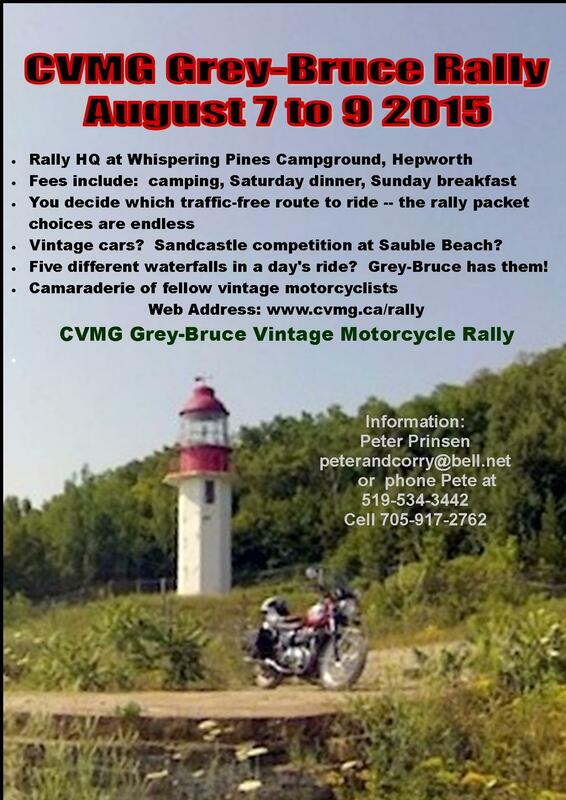 Grey-Bruce section of CVMG had our first ever rally in August of 2012. We will be putting on a seventh annual rally for all to enjoy the second weekend of August of 2018.. Above is the rally poster for the year 2015. 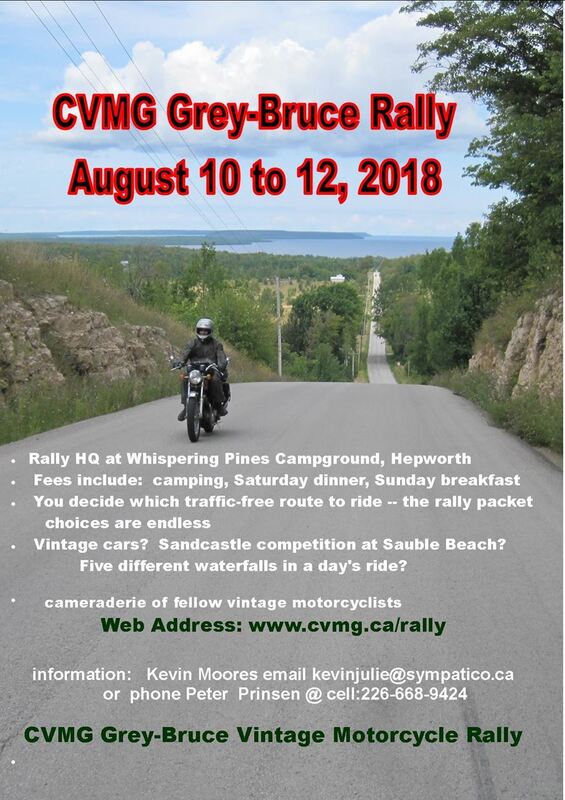 The weekend of August 10 to 12 0f 2018 is the date for our seventh annual CVMG Grey-Bruce vintage motorcycle rally.